Smaller shuttle buses are nice if you only have a few people to transport, but sometimes you need something that packs a bit more of a punch, and that’s not always easy to get. 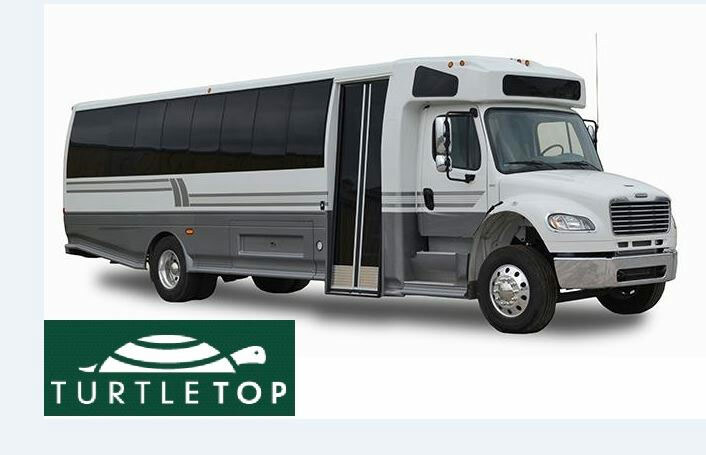 When you buy a Turtletop bus, you know you’re getting the best, but just like any other bus manufacturer, it features quite a few transportation options that are designed to carry twenty or perhaps thirty people at most. This number is significantly reduced if they have luggage, or if ADA compliance is a factor. This, however, is where the Odyssey XLT will come into the picture. The XLT is a shuttle bus and motorcoach series that supports an astounding fifty-one passengers without sacrificing comfort or safety. This is the premium solution for your business, and one that you’re going to enjoy for many years to come. This bus for sale can be used in a wide variety of different applications. This includes churches, college campuses, county transportation, assisted living facilities, cross-country touring, and of course many other scenarios in which a large number of people need to be transported at the same time. As far as a Turtletop bus for sale goes, this is without a doubt one of the better options for larger companies. First of all, yes, it is great for moving large groups of people around, which is wonderful, but in this way it also saves you money, even if the initial purchase is a bit more expensive. The more people you are able to ferry around with a single vehicle, the more you will save on gasoline along with other expenses that would accompany a larger fleet of vehicles. With the XLT, you are going to be in good hands, and ready to take on nearly any transportation related challenge. The Odyssey XLT has plenty of features that you really can’t pass up, especially if you’re looking for a reliable vehicle that will appeal to everyone. Though the XLT does typically come on the Freightliner M2-106 chassis, you can choose to take a different route by going with the Fort F650 which has the same level of quality. As always, separate warranties exist between the chassis manufacturer and the vehicle modifier, so make sure you know which one to call. The sides feature clear view windows, along with a contoured, curved, and tinted exterior that is more than pleasing to the eye. The wide interior allows for a double row of luxury seating, and the flexible floor plans permit you to meet ADA compliance laws by adding wheelchair capability. Safety features are standard in the XLT model with a steel roll cage and a full perimeter steel floor to help guarantee the security of the passengers in the event of a collision or full inversion of the vehicle. Not only will this give you peace of mind, it will give your passengers the confidence they need to ride with you –even if they are not fully aware of the vehicle’s specifications each and every time they board. Finally, the body and A/C warranty are outstanding, and will ensure that you get the repairs you need, when you need them. Keeping your bus in working order is more important than you might realize, and the warranty will carry you a long way. As you would expect from any bus for sale, the XLT has an amazing selection of floor plans for you to choose from. At maximum capacity, as we said before, the XLT is capable of transporting fifty-one passengers, but there are other configurations that allow for extended cargo storage and fewer passengers. You also, of course, have those configurations that account for ADA compliance and in doing so reduce the number of passengers that can be carried. In spite of this, the XLT is one of the best solutions in the industry when it comes to transporting multiple people at once. Take a look today and get ready to put your plans into motion.